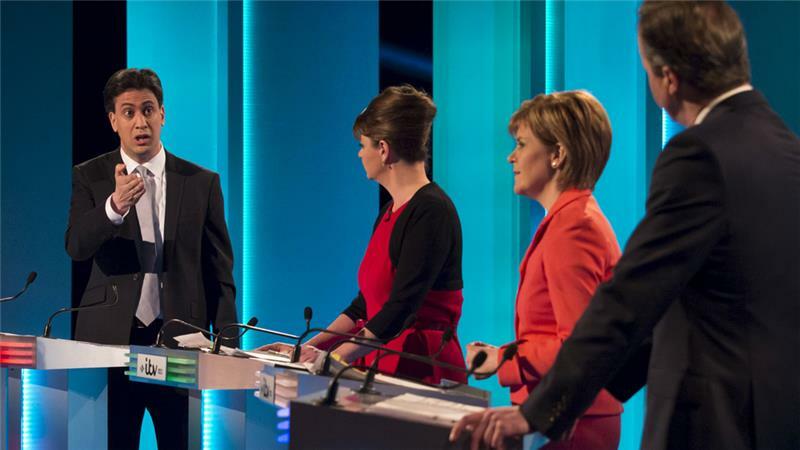 Glasgow, UK – Some seven million viewers across Britain tuned into the first, and only, televised multi-party debate ahead of May’s general election. What they saw on April 2 was a stark illustration of how much UK politics has changed in recent years. Conservative Prime Minister David Cameron fielded questions from the live studio audience, and parried blows from opposition Labour leader Ed Miliband. But the real winners were the five smaller parties also on the stage. Polls declared Scottish National Party (SNP) leader Nicola Sturgeon the victor of the night, followed by the eurosceptic United Kingdom Independence Party’s (UKIP) Nigel Farage. British politics has long been a two-horse race. But the field for May’s general election is increasingly open, potentially spelling a permanent end to centuries of single-party majority rule at Westminster. In 1951, 97 percent of the UK electorate voted Labour or Conservative. At the last general election, in 2010, that figure was just two in three, leading to a historic coalition between the Tories and the Liberal Democrats. This time around, the prospects of one party winning overall control look even slimmer. We have about a quarter of the electorate saying they are going to vote for someone other than Conservative, Labour or Lib Dem. That is just off the end of the historical pattern. Labour and Conservatives are tied at 34 percent each, according to aBBC poll of polls. The Labour party would need a lead of around five points to win a majority, said John Curtice, professor of politics at Strathclyde University. Due to the vagaries of Britain’s first-past-the-post system, the Tories, who draw most of their support in the richer south, would require a seven-point margin of victory to emerge with the 326 seats needed to command a majority in the House of Commons. “We have about a quarter of the electorate saying they are going to vote for someone other than Conservative, Labour or Lib Dem. That is just off the end of the historical pattern. You can go all the way back to 1832 and you won’t beat it,” Curtice said. A hung parliament would necessitate something on which British politics has traditionally not been strong: horse-trading and deal-brokering. The coalition government has long been the norm on the continent, but in the UK it is still a relative novelty. A predicted collapse in the Liberal Democrat vote – and theFixed Term Parliaments Act introduced in 2011 to make dissolving Westminster almost impossible – could make the business of forming a new government even more tricky. This all means that the party that emerges in the strongest position may have to reach an arrangement – either a formal coalition or a looser deal – with one or more of the UK’s insurgent parties. The most likely kingmaker is the SNP, which is campaigning on an anti-austerity message. Despite defeat in last September’s independence referendum, the nationalists have seen their support surge. Membership has quadrupled to more than 100,000. Polls suggest that the SNP may win dozens of seats from Labour, making it far more difficult for Miliband to secure a majority. Last year’s independence referendum fundamentally changed Scottish politics, said political commentator Gerry Hassan. UK parties have struggled to understand the SNP surge. Last weekend a leaked memo purportedly revealing that nationalist leader Sturgeon had told a French diplomat that she would prefer another Tory administration, appeared in the right-wing Daily Telegraph. But the smear appears to have backfired, with both sides flatly denying the claims. Questions have been raised about how the civil service document was released. An inquiry will now be held. While the SNP will take votes from Labour in Scotland, the Conservatives in particular face a threat from the UKIP. The party, which campaigns on a hard-right platform based on clamping down on immigration and leaving the European Union, is particularly popular with socially conservative, white working class voters. Cameron has promised a referendum on EU membership in a bid to stem the UKIP tide. UKIP’s best chances of success rest with its colourful leader Farage in South Thanet. On the opposite end of the political spectrum, the Greens believe this could be their breakthrough year. Having polled barely one percent in the 2010 general elections, the left-wing environmentalists are hoping to add to their solitary seat in Brighton Pavilion. However, the winner takes all nature of the British electoral system means both UKIP and the Greens are struggling to win more than a handful of seats. Darren Hughes of the Electoral Reform Society, says that the “lottery” nature of the May’s election shows that the time has come to replace first-past-the-post with a more proportional voting system. Regardless of the prospects of electoral reform, the duopoly in British politics could be coming to an end as voters leave Labour and Conservatives for small, identity-based parties. Across the UK, traditional class structures, and the political affiliations that went with them, are breaking down, says Professor Curtice. At the same time, voters see little to choose between Miliband and Cameron, or between their respective parties. “The Conservatives and Labour in recent elections have tended to look more similar to each other in the eyes of the electorate,” says Curtice. Whoever wins in May, the likelihood is that when the UK general election next swings around in 2020 television producers will need to invest in larger studios. The panel of party leaders could be even bigger.